the producer: It's kind of my love letter to this town. Ambition, the blackest of human desires. Everyone has it. But how many act on it? That's what intrigues me. Sarah, if you can't really let yourself go how can you ever transform into something else? 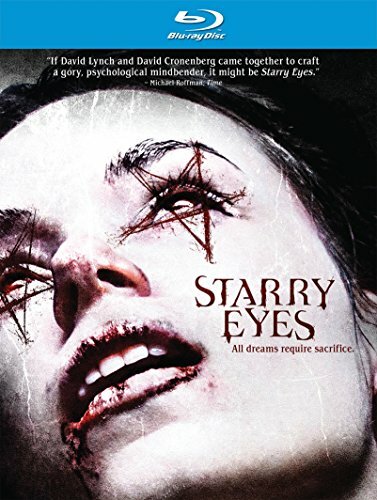 『Starry Eyes (2014)』のエンディングはハッピーエンディングだ。サラさんは自分の夢を叶えたのだから。よかったじゃないか。おめでとう。<3 LA ! the producer: It's kind of my love letter to this town. Ambition, the blackest of human desires. Everyone has it. But how many act on it? That's what intrigues me. That's what lights me up as they say. There's something primal they're and that's why you're sitting right here in this room. Sarah: But I mean, it's a horror movie as well. the producer: Of course. The two are not mutually exclusive. This industry is a plague Sarah, a plague of unoriginality, hollow be thy name, shallow be thy name. Yes, it's a plague alright. And what does every plague have a lot of? the producer: Precisely. Yes, thousands of them, hungry little rats, hungry for the cheese. You cut through the fog of his town and you get desperation, plastic parishioners worshiping their deity of debauchery. But that's what I find interesting, Sarah. That's what I want to capture in this film, the ugliness of the human spirit. Sarah: Yeah, okay, I mean, I can see that. the producer: So why do you do it, darling? Sarah: Why, why do I do what? the producer: Why do you pull your beautiful hair out? Sarah: Um.. it's just a habit. I started doing it when I was a little girl and it helps me focus on the moment. the producer: The moment. Well, this is a moment. Sarah: Yes, yes, it is. the producer: The role of Celeste is a really big deal for a young actress with no other credits to her name. Your face will be on the poster. The poster on a wall, a wall in a lobby, a lobby of a movie theater, a theater with a marquee, The Silver Scream. Now you know that doesn't happen very much anymore, right? This is a great opportunity for a young actress, a great opportunity for an actress with ambition. Sarah: That's me. I'm your girl. I'll do whatever it takes for this role. the producer: Good. Because we want to offer it to you. We think you could be great in this role, Sarah. I think you could be great in this role. Sarah: I agree. Truthfully, I think I am this role. I mean, this character has a dream and she has so much potential. the producer: Sarah, forget about all that. This world is about the doers, the people who don't just talk about what they're going to do, they just do it. And that's you. Sarah: Thank you. Thank you for saying that. I worked so hard, you know. Every week it's a new class, a new audition and I just never... Uh, if you want me to, to read more with other actors, um, or another audition. the producer: Sarah, this is the audition. I told you before, very very few actresses ever get to this room. Sarah, you're at the gates. All you need is for me to open them for you. I can make you a star, Sarah. You know I can. Sarah: Whoa! No! Let me out! Open the door! the producer: Show me the girl I thought you were. Let me see the real, Sarah. the producer: You can go into the ground to be forgotten forever or you can be reborn. Did you expect it to be painless, that it would be easy, that you'd simply wake up one morning with everything you ever wanted laied out before you? I told you Sarah, dreams require sacrifice. And so do we. I can give you what you want Sarah, but you need to embrace who you really are. It's time to become one of us. It's time to be remembered. Sarah: There's only one thing in this whole world that I want and they're going to give it to me. They see the real me. the producer: She is ready to transform!